Challenges in orbital floor fracture management include delayed symptom onset and controversial surgical indications based upon radiographic findings. This study assesses which imaging characteristics most reliably predict symptomatology to generate a tool that estimates need for surgery upon initial presentation. Clinical course for all patients with isolated orbital fractures at a single institution were reviewed. Trauma mechanism, CT characteristics, and symptoms necessitating surgery (diplopia, enophthalmos, hypoglobus) were noted. 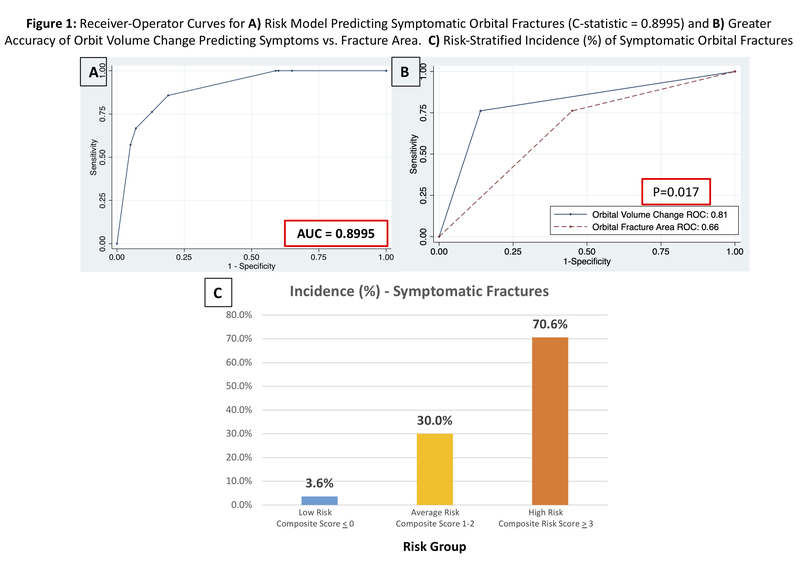 Uni- and multivariable regression modeling generated a predictive risk model for operative fractures. 121 patients with orbital floor fractures from falls (41%), assault (37%), or vehicular trauma (17%) were followed for 4.4 (0-48) months. 25% had concomitant medial wall fractures. Average fracture area was 2.4 cm2(+1.1cm2), while orbital volume increased 0.70 cm3(+0.98cm3). 21 patients (17%) developed symptoms necessitating surgery. The strongest predictors of symptoms were orbital volume increase >1.31 cm3 (OR=10.5, p=0.001) and inferior rectus displacement within or below the fracture line (OR=3.7, p=0.049), while falls were protective (OR=0.08, p=0.005). Symptom risk was stratified from Low (3.6%) to High-Risk (71%), C-statistic=0.8995. Orbital volume change was significantly more predictive of symptoms than fracture area (C=0.81 vs. C=0.66, p=0.017). The proposed risk-tool allows highly accurate, early prediction of symptomatic orbital floor fractures. It suggests orbital volume change, not fracture area, may be the most reliable indication for orbital reconstruction, along with inferior rectus muscle caudal malposition.